A "Stone Ship" also called "Ship Setting" (Danish: Skibssætning, German: Schiffssetzung, Swedish: Skeppssättning) was an early Viking/Scandinavian/Germanic burial custom which was mainly followed in Scandinavia but was also practised in Germany and the Baltic states. The practice was prevalent from Bronze Age (1000 BC) to the Viking Era of about 1000 AD. These tumuli are called stone ship as these were outlined by large stones in the form of a hull of a Viking ship. Archaeologists have suggested that the ship like shape was adopted probably because the Vikings were seafarers and wanted to give their dead a ship for their last journey. The grave(s) within ship also contained items of daily use. The number of ships at a particular grave field varies from just one to two/three or even more. The size of the ships varies from few metres to 80-100 metres or more and perhaps depended on the social status of the deceased. 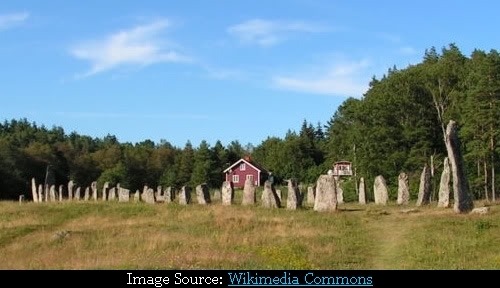 In this post I have tried to locate the major stone ships found in Sweden, Denmark, Norway and Germany, as this practice was prevalent mainly in these countries. My main sources of information and location are the Wikipedia (English, German and Swedish) plus few web sites found on the internet specially grosssteingraeber.de (A web portal about the Megalithic tombs and monuments). 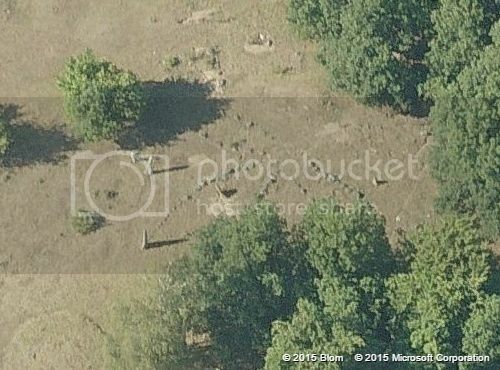 Most of these stone ships, were not placemarked in Google Earth and have now been placemarked. For sake of completeness, I have also duplicated a few which were already placemarked. In case I have missed any major stone ship then please let me know and I will include it in this collection. Note: Wikipedia mentions about a 20-metre ship at Kerteminde fjord, Denmark. I couldn't find any information about it or its location. My guess is that the user who wrote in Wikipedia was referring to Ladby Ship found near Kerteminde. It is a wooden ship and not stone ship, hence I have not included it in this collection. Brief description, photo and location of each ship is given below. Bække Stone Ship is part of a burial mound of Viking era, known as Bække Monument (aka Klebæk Høje), located in Ribe County, Jutland, Denmark. The ship is 45 metres long and out of original 60 stones only 9 stones have survived. The missing stones have been replaced with smaller stones to mark the ship's original shape. Gammel-Lejre is an ancient village on the island of Zealand in Denmark and has great archaeologically significance as it has been in continuous settlement since the Stone Age. It's 80 meters long stone ship is, reportedly, the largest most complete ship in Denmark. The Glavendrup Stone Ship located on the Funen Island, Denmark, dates back to the middle of the Viking age (early 10th century). It is 60 meters (201 feet) long and has a runic stone at its Western end, and has the longest text on a runic stone in Denmark. The ship is surrounded with tall trees hence it is not visible in Google Earth imagery. The Stone Ship at Jelling, Denmark is the largest Stone Ship known to have existed. 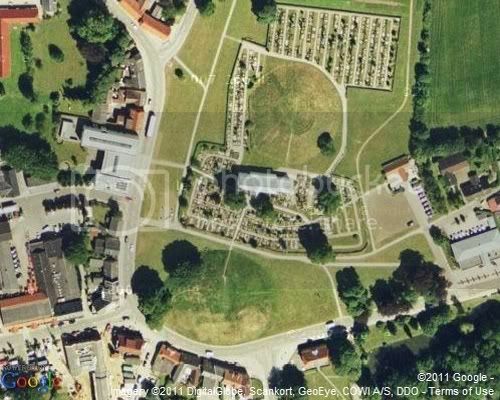 However no portion of the ship is visible today, as it lies buried under the two famous royal burial mounds and the old Danish Church at Jelling. Initially the archaeologists had estimated that the Stone Ship was 170 metres (560 ft) long with its one end under the north mound and the other end beyond the southern mound. However later ground radar studies, diggings, and researches have led to re-evaluation and it is now thought that the north mound lies at the centre of the ship and length of the ship is estimated to be about 354 metres (1,161 ft). Source of info and more info: Wikipedia / Fortidens Jelling (In Danish) (English Translation). The latter contains few illustrative sketches also. Lindholm Høje is a major Iron age, Viking Burial Site on the outskirt of Aalborg, Denmark and contains several ship/oval shaped burials. Currently there are about 700 graves belonging to the period from 400 AD to 1000 AD. The graves for men are shaped like a ship with pointed ends, while those of women are oval shaped (rounded ends). 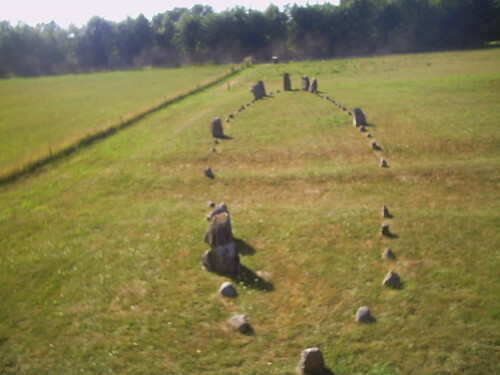 The Viking Age burial site at Altes Lager Menzlin, near Anklam, Western Pomerania, Germany has a total of eight ships in grave field besides 11 stone circles. The ships, however are in the wooded area hence not visible in GE imagery. The village was an important Viking trade post and reportedly the stone ships here are the only stone ships in the southern Baltic region. This grave field from the Roman period contains 3 Stone Circle and two stone ships belonging from the 5th and 7th century AD. The smaller ship measures approximately 10 x 2 meters and is made up of seven, one metre high stones. The second and larger ship measures about 25 x 9 meters. These ships contained cremated remains and grave goods. The Stone Ship located on the coast of Kåseberga, Skåne, Sweden and popularly known as Ales Stenar (Ale's Stones) is Sweden's largest preserved stone ship. The 67 metres long and 19 metres wide ship consists of 59 stones weighing between 500 and 1800 kilos and was created sometimes in late Bronze Age / early Iron Age. Ales Stenar also known as Stonehenge of the North has been a subject of many myths. No one knows as to why it is called Ales Stenar. Unlike other stone ships, no grave has been excavated in this region, which has led to speculation that it is not a burial site. Moreover the stones are so aligned that the sun sets over the northwest tip of the monument during the Summer Solstice and rises at the opposite tip at Winter Solstice. Many believe that it is some kind of astronomical calendar. Ängakåsen Grave Field in Kivik, Sweden dates back to later Bronze Age (1000 - 500 BC). Besides a stone ship there are about 130 small and a large stone setting. 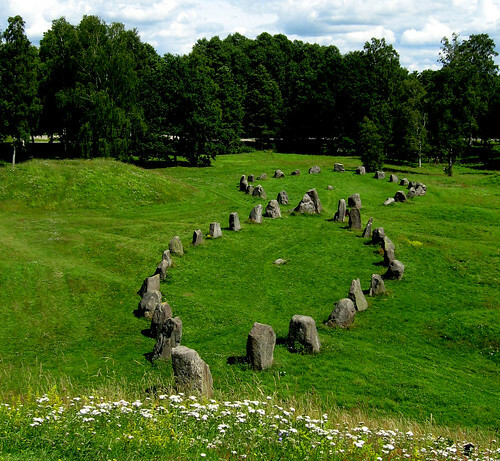 The stone ship measures 60x8.5 metres and consists of 30 standing stones. Anundshög Stone Ships are located near Sweden's largest and Northernmost Tumulus - Anundshög. Reportedly there are five stone ships, however only 4 ships are visible in the GE imagery. Out these four, 2 large stone ships having length of 51 metres (167 ft) and 54 metres (177 ft) respectively, are placed end to end. Årby Stone Ship is part of burial mound located about 3 km northeast of Kolbäck, Sweden and dates back to late Iron Age. No further details about it are available, however as per GE measurements it is about 18.5 metres long and 6 metres wide. Image copied from Kolbäcks hembygdsförening is used here after due permission. 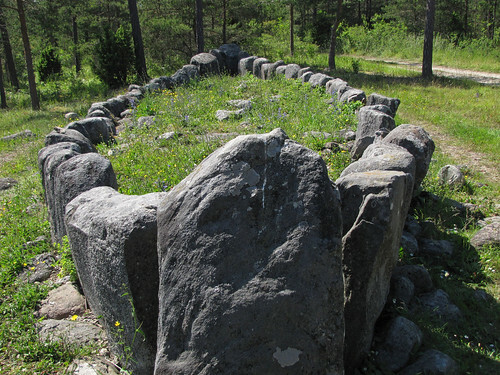 Askeberga Stone Ship aka Rane Stenar (stones) is located in Askeberga, Vads parish, Västergötland Sweden. The ship is 55 meters long and 18 meters wide and consists of 24 boulders, up to 2 meters high and weighing each up to 15 tons. An unusual feature is that the ship has no bow and stern stones. The dating is unknown but is probably in the late Iron Age. Image from Wikimedia Commons is by Harri Blomberg. The stone ship in Blomsholm near the Strömstad Municipality, Västra Götaland County, Sweden is one of the largest stone ship in Sweden. The 40 meters long ship consists of 49 stones and was built sometimes towards the late Iron Age. Inside the ships are graves/memorial stones of officers of Charles XII, under the command of General Rank Sven, who had established a field hospital in the nearby mansion during the Great Northern War (1700–21). Source of info: grosssteingraeber.de (In German) (English Translation). This stone ship on the Gotland Island, Sweden is from Bronze age and measures 13.5x4 metre. The Gannarve stone ship Fröjel parish south of Klintehamn, Gotland, Sweden, is from the late Bronze Age. Most of the stone ship which measured 29 x 5 metres was destroyed with passage of time and few bow and stern blocks had survived. It was however reconstructed in 1959 after an archaeological study of the surrounding area/stones and what is seen today is a completely reconstructed ship. Reportedly there was another ship here but no trace of same remains today. 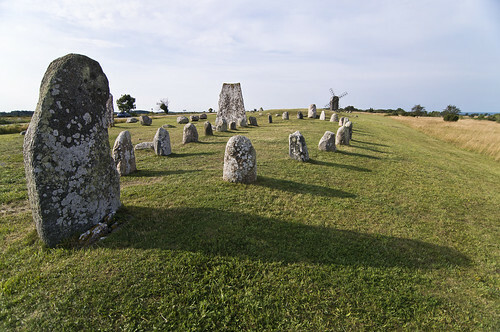 Gettlinge Stone Ships are part of a big, nearly 2 kilometres long gravefield in the village of Gettlinge, in the southwest portion of the island of Öland, Sweden. The largest ship is 30 metre long and consists of 23 granite blocks. Besides this there is another smaller one. In addition there are more than 200 stone circles, though in the past there were many more and several of these have vanished due to quarrying of the stones. Most of the stone circles are from the late Bronze Age / Iron Age. There are three ships in the Gnisvärd fishing village, Gotland, Sweden. The largest of these is 47 meters long and 7 meters wide. Other two are 50 metres and 150 metres South respectively from the largest one, and lie in the same orientation. Being a wooded area, only the largest ship can be hardly seen in the Google Earth imagery but is visible in Google Street View. About one kilometre to the west lies a modern day replica ship which was constructed by a local landowner from the ancient stones found on his farm. This ship can be clearly seen in GE. This stone ship at the Gnisvärd fishing village, Gotland, Sweden is modern day construction and lies about one kilometre to the west of the three ancient Gnisvärd Stone Ships. The replica, locally known as Gnisvärd Private Stone Ship, was built by local landowner from the ancient stones found on his farm. Image copied from grosssteingraeber.de is used here after due permission. In my original post I had mistakenly used the wrong image of replica Gnisvärd Stone Ship. I have corrected the mistake now. I am thankful to Reinhard Möws for informing about the mistake and also allowing me to use the correct image from his website grosssteingraeber.de. Gumhems is a Viking grave field in Kinda Municipality, Östergötland, Sweden and dates from the late Iron Age (500-1050 CE). One of the biggest stone ship in Östergötland can be seen here. The stone ship consists of 22 standing stones that form a "ship" in a south-easterly direction with a length of 17.5 meters and a maximum width of five meters. Note regarding location: I had originally placemarked it at 57° 55′ 38″ N, 15° 51′ 14″ E, which was based on the Swedish Wikipedia referred above. However the web page of Swedish National Heritage Board gives its location at 57° 57' 40.73" N, 5° 51' 0.00" E. I have therefore relocated the placemarker to the later location. The ship however cannot be visualised at this location though a circular grave can be seen nearby. I am thankful to Reinhard Möws (grosssteingraeber.de) for informing about this discrepancy. 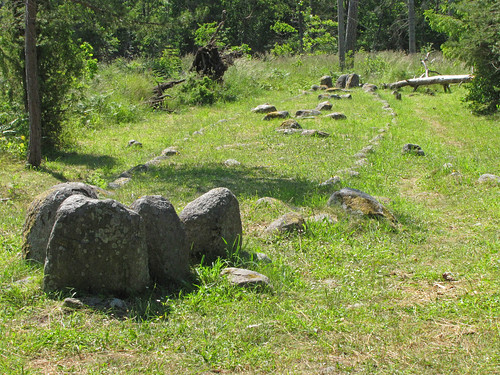 A stone ship at Hammarskulle grave field, Ronneby, Blekinge, Sweden. The graves are from the late Bronze Age to the Viking period. As per Google Earth measurements the stone ship is about 25 x 9 metres. 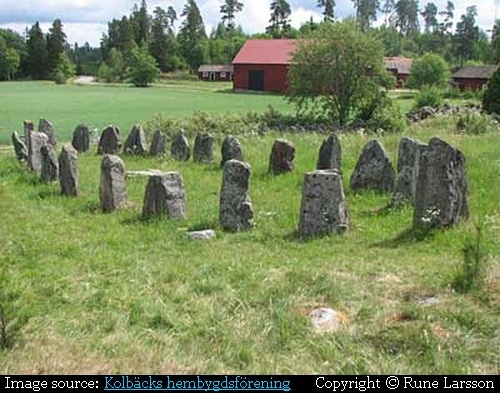 Hjortahammar is a grave field in Förkärla parish Ronneby, Sweden and contains 70 round stones, eight square stone circles, four tridents, five burial mounds, 10 stone ships, five stone rows and standing stones 8. The largest stone ship is 40 meters long, 12 meters wide and consists of 9 standing stones of which the highest is 1.8 meters high. 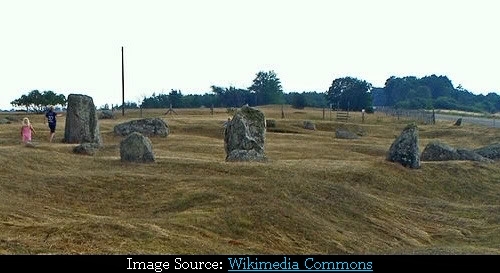 Hjortsberga grave field in Ronneby, Blekinge, Sweden is one of the the best preserved graveyards in the region and dates back from the early Iron Age to the Viking Age. There area about 110 monuments located in open terrain on the top of a ridge out of which there are19 stone ships. Details of these ships couldn't be found but as per measurements made through Google Earth one stone ship appears to be about 19 x 9 metres. Hulterstad Stone Ship is part of Viking gravefield in the small coastal town of Hulterstad on the island of Öland, Sweden. The gravefield comprises over 170 individual burials but only one stone ship, which is also partially damaged. Not much information is available about it, however in as per Google Earth's measurement tool, the ship's outline appears to be about 45 x 13 metres. Image cropped from original at Wikimedia by C. Michael Hogan. 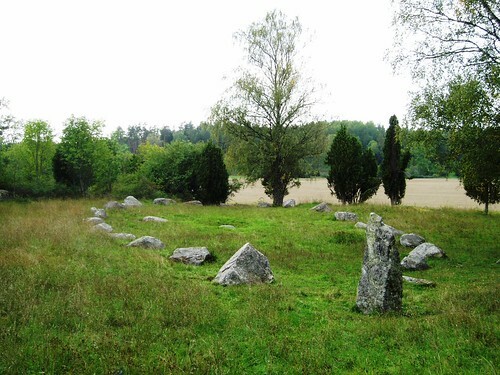 This grave field at Karlskrona in Blekinge County, Sweden has several graves such as ship, rectangular and triangular stones, mounds and individual standing stones. Four ship stones are arranged in the form of a clover leaf out of which only three have survived and can be clearly seen in aerial/satellite view. The cemetery dates back to the late Iron Age. The Karume Alvar Stone Ship near Högsrum on the Swedish island of Oland is a 26 metre long stone ship within the Karume alvar grave field. Besides the stone ship which is locally known as Noah's Ark (Swedish Noaks ark), there are many round and few rectangular stone settings. The oldest monument in this cemetery is dated to the later Bronze Age, 1000-500 BC. The ship cannot be visualised in the GE imagery probably because it is not made of large stones and presence of other stone settings in the vicinity. 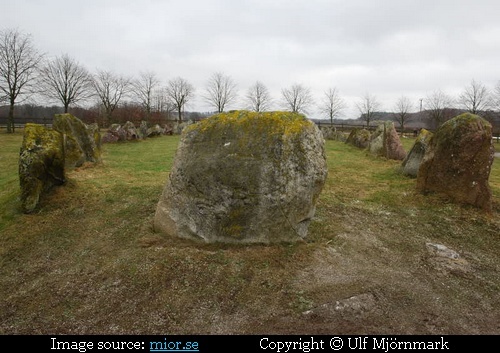 Mala Stenar is a grave field in Mala town of Hässleholm, Skåne County, Sweden. The grave field contains about 50 ancient monuments which include six stone ships. The largest stone ship is 16.5 x 6 meters and consists of 16 standing stones. Mjösjön Stone Ship is located near the south end of Mjösjön lake near Holmsjön in Umeå municipality, Sweden. Besides the Stone ship, which is Sweden's Northern most ship, there are four graves from the Bronze Age and two cairns and a stone circle. The stone ship was built about 4,000 years ago in the Bronze Age and measures 16 meters x 4 meters. Archeologists feel that it was built close to the coast but with the land uplift it is now almost 2 km from the coast. The ship was restored 1n 1970. Being in heavy wooded area it cannot be visualised in GE imagery. 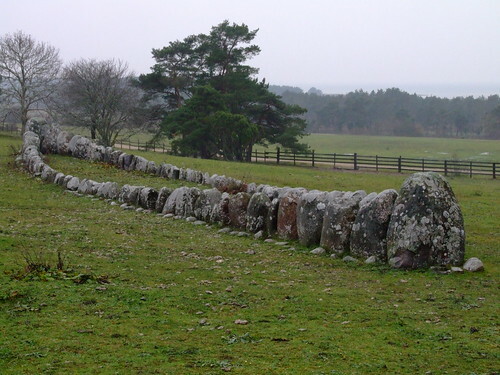 The Nässja Stone Ship located in Nässja Parish, Vadstena Municipality, Östergötland, Sweden, measures 44×18 metres and is made of 24 large stones, of which 10 are standing. 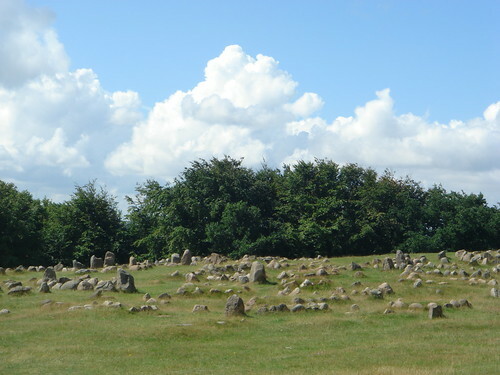 The stone circle was excavated in 1953. One peculiarity of this ship is that the bow and stern stones are missing. 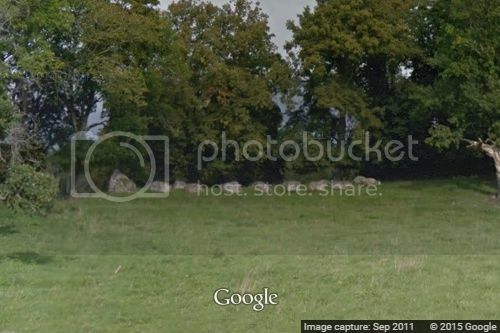 The stone ship cannot be visualised in GE but can be seen in Google Street View. Image from Wikimedia Commons is by Yogidoo. The Stone Ships at Rannarve, near Klintehamn, Gotland, Sweden, belong to Bronze Age and are a group of four ships placed together in perfect linear formation with bow of one ship touching the stern of other. Each ship is 9 metres long and 5 metres wide. Image Source Google Maps. 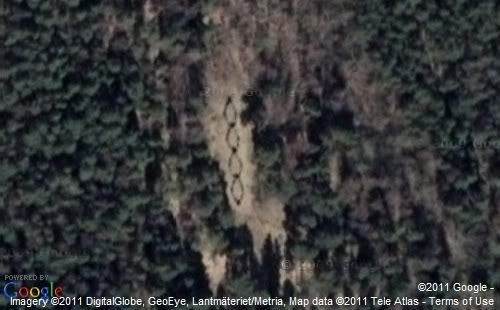 The stone ships can be seen in Google Earth in the Dec 31, 2007 imagery but cannot be seen in the later updates. 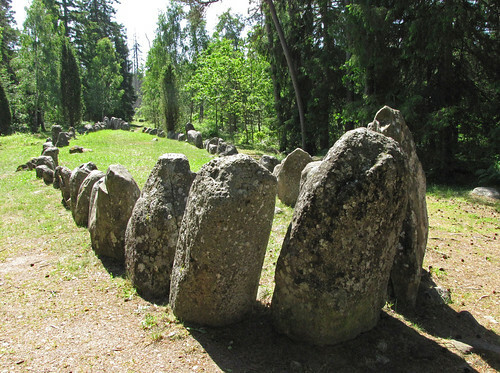 Runsa Stone Ships are part of the grave field near the ancient fortification located in Upplands Väsby Municipality in Sweden. There are two stone ships, however only one is visible in GE. First ship is approximately 53x16 metres consisting of 28 lump-shaped rocks and the second is about 37x9 metres. The Stenhed stone ship located near Gärsnäs in Skåne, Sweden is 50 m long, 14 meters wide and like the Ales stenar, its bow and stern lie in northwest to southeast direction, leading to speculation that it was also used as Astronomical calendar. As per Gutasagan (The Saga of the Gotlanders), Gotland was first settled by the legendry hero Tjelvar and he is buried in the Stone Ship near the village of Tjälder in Gotland in Sweden. The ship commonly known as Tjelvar's Grave is 18 metres long. 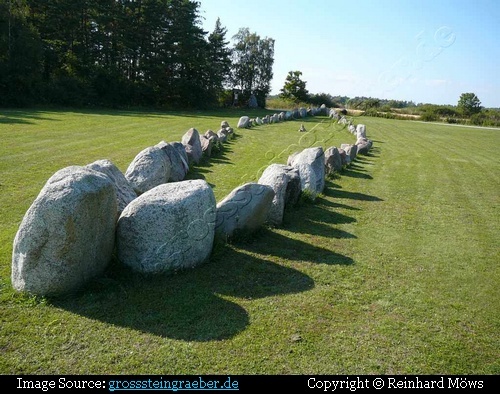 The Ugglarp Stone Ship, near Dalby in Lund Municipality, Skåne County, Sweden is one of largest stone ship in Sweden. This stone ship which belongs to early Iron Age was restored in 1952 and is 45 meters long with 39 upright stones. Image copied from mior.se and is used here after due permission. 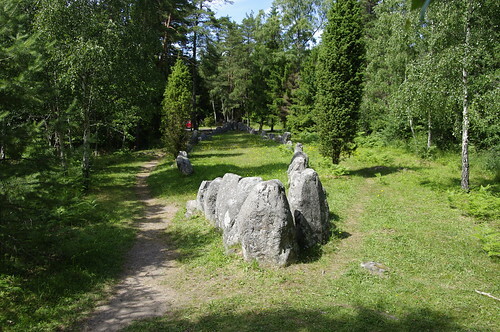 The Vätteryd Stone Ships are part of an Iron Age grave field. There are 15 stone ships, however most of these are damaged and only the largest (25 m x 8 m) is discernible in the GE imagery.